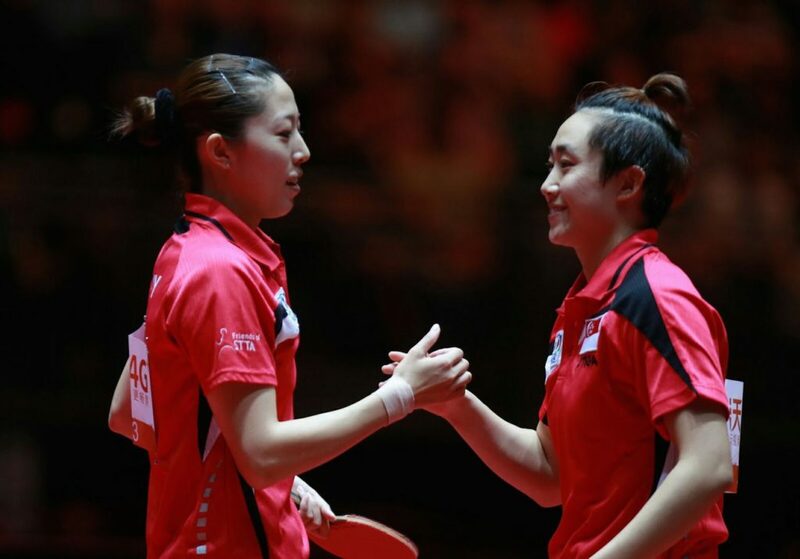 Mima Ito and Hina Hayata, both 16 years of age stormed into the Women's doubles semi-finals, thus becoming the youngest pair from Japan to reach the semi-finals of the World Championships, assuring themselves of a medal. Mima Ito and Hina Hayata beat Hong Kong’s Doo Hoi Kem and Lee Ho Ching in the quarter finals in straight games (12-10, 11-8, 11-4, 11-6) to climb the ladder and move to the semi-finals. They are thus assured of a medal at the Liebherr 2017 World Championships. The Japanese girls will now contest against the mighty third seeded Chinese pair Ding Ning and Liu Shiwen who knocked out India’ s Manika Batra and Mouma Das in a quick 4-0 match. They are the Silver medalists from 2013 World Championship held in Paris, and just a very strong pair. In the top half, Singapore’s Feng Tianwei and Yu Meng Yu stormed in the semi finals beating Chen Szu-Yu and Cheng I-Ching of Chinese Taipei in a thrilling six games encounter (11-9, 6-11, 11-9, 12-10, 8-11, 11-8). This is the third time in a row that the pair has reached the semi-finals, after making it in 2013 and 2015. They are up against China’s Chen Meng and Zhu Yuling who overcame USA’s Lily Zhang and Wu Yue in five games ( 12-14 ,11-6,11-9, 11-5 11-7). It will be a challenge for the Singaporeans, as in both the occasions that they reached the semi-finals, they had lost to Chinese pair. Semi-finals will be played on 5th June from 12:00pm onwards.